Desert X Parallel Projects showcase local artists and attractions from Joshua Tree to Pinyon Pines. Richard Hovel holds a smaller version of what will be Looming Shelter, a fiber-centric collaborative exhibit set to debut Feb. 9 as a parallel project of Desert X. When an international art exhibition comes to town, bringing rockstar-level talent who use the environs as source material, how do local artists respond? They throw a party. In the case of Desert X, several parties — along with performances, exhibitions, workshops, and demonstrations, spread from one end of the region to the other. That’s just counting what’s been sanctioned as an official “Parallel Project.” There will undoubtedly be more gallery openings plus a guerrilla installation or two. • For a preview of Desert X, click HERE. Desert X is a 10-week biennial exhibition of site-specific art that debuted in 2017. The second iteration opens Feb. 9 and runs through April 21, with 19 installations from Snow Creek to the Salton Sea and almost every Coachella Valley city in between, plus two locations in Mexico. In the first year, organizers had their hands full with the main program. There were a few informal partnerships such as the three-day Joshua Treenial, but this year there are 15 designated projects ranging from exhibitions at Coachella Valley Art Center and the Walter N. Marks Center for the Arts at College of the Desert, to permanent attractions such as the Noah Purifoy Outdoor Museum and Edoardo Tresoldi’s Etherea installation in Coachella. Annette Heuly works on assembling the Looming Shelter at Makerville. Looming Shelter opens on Feb. 9 with an afternoon reception, and will host workshops and demonstrations throughout the run of the exhibit. 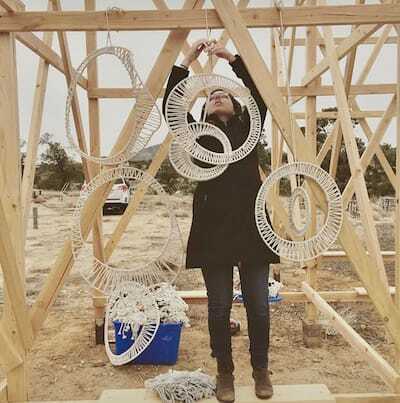 Debra Hovel is one of the founders of Makerville, located in the Pinyon Pines area of the Santa Rosa Mountains. In 2015, she and Richard Hovel, Jay Zaltzman, and Kurt Cyr bought an abandoned Elks Lodge on 10 acres of wilderness behind the Sugarloaf Café. They hauled off truckloads of concrete, garbage, and empty beers and transformed it into artist studios and event space. 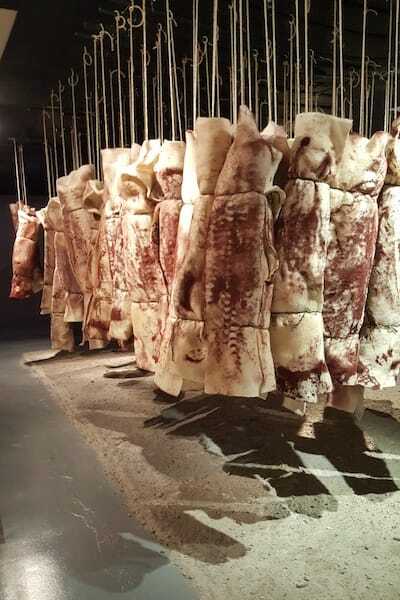 For Desert X 2019, they partnered with Textile Arts Los Angeles for their Parallel Project, Looming Shelter. 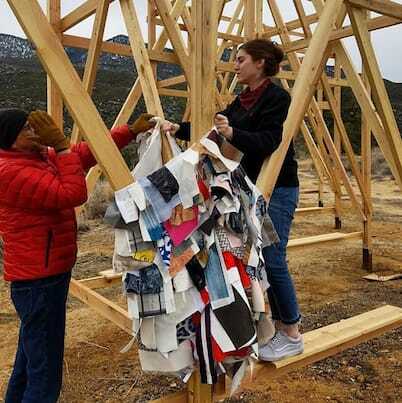 The Makerville artists built a large wooden scaffold — “a monumental framework that provides structure but not content or context,” according to the project description — and invited the fiber artists to attach woven, knotted, sewn, dyed, rescued, and recycled material. The result should be like snuggling up in a cabin-shaped sweater. Dotting the landscape will be other artworks delving into ideas of exposure, inclusion, and retreat. Looming Shelter opens on Feb. 9 with an afternoon reception, and will host workshops and demonstrations throughout the run of the exhibit. • See our art story about a 40-year survey of Sam Francis paintings at Heather James Fine Art. Some of this year’s Parallel Projects address the same themes as Desert X — the environment, in particular — but from a first-person perspective. Check websites and social media for times and additional information. Access to the projects sometimes requires driving on unpaved roads or walking over loose sand. Weather conditions may affect accessibility. Contact the organizers if you have mobility questions. Michelle Castillo celebrates her heritage with Lola’s Kusina, a pop-up eatery connected to notions of home, homeland, and identity. 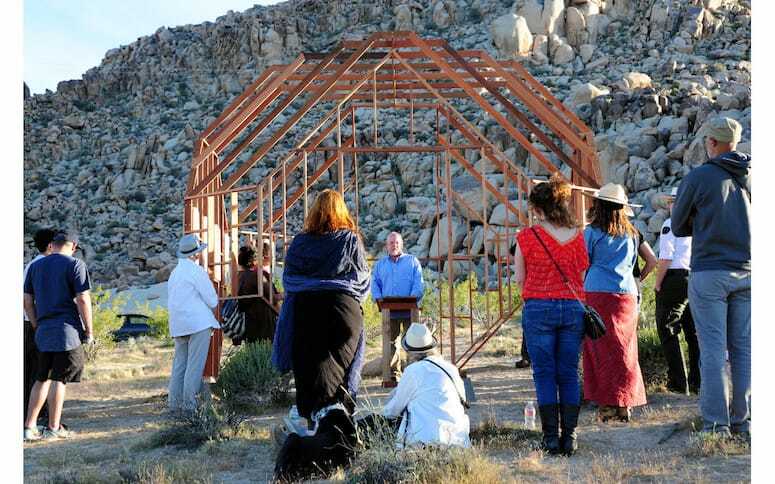 One of the High Desert’s newest artist residencies opens to the public with sculpture, performance, and dialogue on themes of location, migration, and cultural diversity. Emerging artist Rene Gortat will present the Artist Shelter, a functional tiny home for future residents. 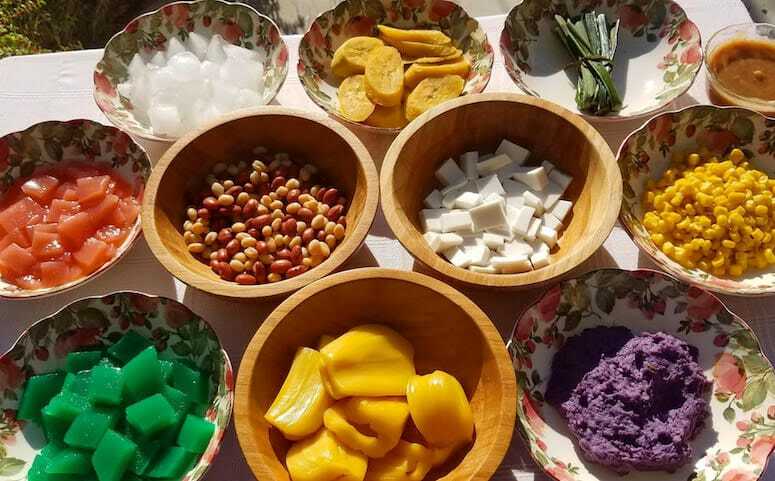 Palm Springs’ Michelle Castillo celebrates her heritage with Sari-Sari, an installation that replicates a Filipino corner store, and Lola’s Kusina, a pop-up eatery cultivating multisensory experiences connected to notions of home, homeland, and identity. Castillo will lead a series of workshops and happenings involving writing, poetry readings, and food preparation, culminating in a shared meal and “public family reunion.” Be sure to see the works on paper from Buckwheat Space founders Yvonne Buchanan and Dorene Quinn. Feb. 9-April 21; check website for hours. Opening reception: Feb. 9, 12-3 p.m. Looming Shelter is a fiber-centric collaborative exhibit. Fiber and textile artists responded to a monumental wooden scaffold, reacting on what it means to seek shelter, how shelter is created, what is necessary, and what can be let go. The central piece serves as a symbol of the larger, defining community, while allowing space for individual artists to perform private gestures and commentary. Artists: Cathy Allen, Bianca Barbaro, Barbara Bryn Klare, Carrie Burckle, Tyler Burton, Rita Capponi, Emilyn Eto, Lydia Hall-Tjioe, Annette Heully, Taylor Kibby, Jeff Morrical, Anessa Shami, Carol Shaw-Sutton, Sovanchan Sorn, and Nancy Worthington. Ongoing. On view from sunrise to sunset. In 2008, Australian artist Andrew Rogers built a pair of massive stone sculptures, or geoglyphs, on a mesa high above Yucca Valley. Part of his global Rhythms of Life series, they are optimistic metaphors for the eternal cycle of life and regeneration, expressive and suggestive of human striving and introspection. They embrace a wide cultural vision that links memory and symbols derived from ancient rock carvings, paintings, and legends; they punctuate time and extend history into the distant future. Ongoing. Tours held Tuesday-Sunday, 9 a.m. to 4 p.m.
Cabot’s Pueblo is a marvel of engineering and design. The home’s construction began in 1941 and was always intended to be a museum as well as residence for Cabot Yerxa and his wife Portia. Yerxa was a businessman, artist, human rights activist, and one of the founders of the city of Desert Hot Springs. The Hopi-inspired building is handmade and created from reclaimed materials found throughout the Coachella Valley. Filled with Native American art and artifacts, souvenirs of Cabot’s travels around the world, displays on Native American civil rights, and Cabot’s own works of art, the Pueblo Museum officially opened to the public in 1949. Weekend events feature traditional sculpture, pottery, and carvings from award-winning artists. In California between the years of 1848 and 1859, 149 Mexicans were lynched, victims of mob violence. Lynchings took place throughout the state and included the first lynching of a woman. Using sculptural insinuation for this little known historical fact, Wm. Marquez has created an installation consisting of 149 suspended objects. Marnie L. Navarro will use sound, projection, and graphics to address the contemporary parallels in our current political and social climates. Being of Mexican heritage, both Navarro and Marquez are compelled to bring to light historical tragedies that are not discussed. Artist Wm. Marquez has created an installation consisting of 149 suspended objects. Coachella Walls is a community revitalization project using murals to enhance local businesses in the historic Pueblo Viejo District. It is produced by artist Armando Lerma and curator Medvin Sobio, and supported by the City of Coachella. Opens Feb. 8 and will be ongoing. Italian artist Edoardo Tresoldi placed three shimmering, translucent, wire mesh sculptures, inspired by neoclassical and Baroque architecture, on the grounds of the 2018 Coachella Music Festival, weaving even more fantasy into the event. One of the pieces will be permanently installed in downtown Coachella. Echoing Desert X’s environmental themes, the sculpture changes with light and atmospheric conditions as well as the perspective of the viewer. Opening Reception: Feb. 20, 5-7 p.m.
For more than 40 years, Jenny Holzer analyzed social issues through the use of words, her modes of delivery varying from printed T-shirts to large-scale light projections. The 53 works in this exhibition include lithographic prints, signs, and a carved bench. Holzer delivers her astringent observations, social commentary, and slyly humorous aphorisms on subjects ranging from war to racism, private and corporate greed. Begins Feb. 23, with the mural to be installed April 6. It will be on view for the duration of Desert X and may be extended into the summer. CREATE Center for the Arts is hosting a community-sourced public artwork with New York-based crochet artist, OLEK, as part of the artist’s series, Love Across the USA. It will be the only collaboration that OLEK and her team conduct in California. The series focuses on empowering women’s voices and building communities through the shared creation of a crochet mural portraying a historical American woman. After an instructional workshop with the artist, participants receive a portion of the mural to complete. OLEK and her team return on April 6 to assemble and install the mural, revealing the subject of the portrait. From 2017, artist Gregory Michael Hernandez created a Decalogue Chapel. 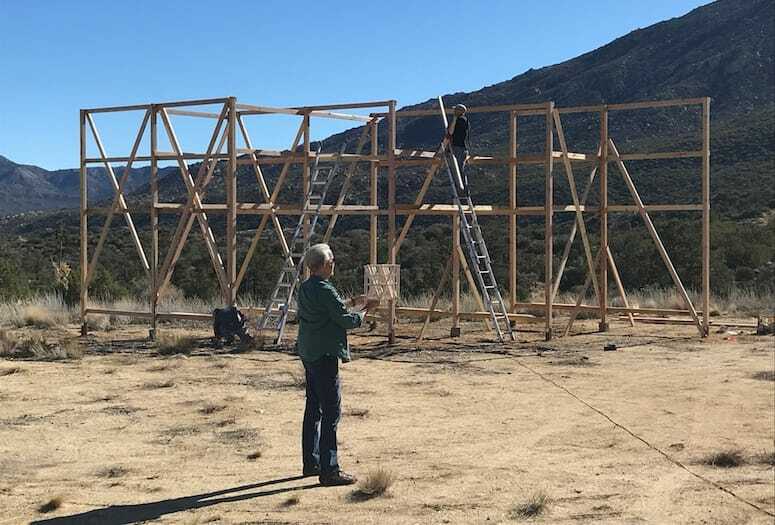 Opening reception: April 12, 7-10 p.m.
Joshua Treenial is a weekend of art, installations, performances, and community building held at BoxoHOUSE in Joshua Tree along with venues such as The Integratron and nearby galleries. This year’s title, Paradise :: Parallax, refers to the desert’s role as a place of refuge and transformation, paradise to diverse forms. Artists explore the region’s history and future from Southern California, Mexico, and Europe. As global warming turns more land into desert, they envision optimistic ways to preserve and protect quality of life. Artists: Carl Berg and Cecilia Miniucchi, Ryan Campbell, Anibal Catalan, Rachel Dagnall and Per Platou, Jeff Frost, Séverin Guelpa, Mary Addison Hackett, Samantha Harris and Almond Zigmund, Adriene Jenik and Dominic Miller, Mathias Kessler, Angus McCullough, Michael Petry, Sabine Reckewell, Aili Schmeltz, Lewis deSoto, and Ivan Wong. Unsettled is a sweeping presentation of contemporary art by more than 75 artists living or working in the Greater West. This provocative exhibition looks to the future while honoring the past, especially those who created a sense of culture long before these places were declared “unsettled.” The exhibition’s fertile terrain runs from the top of Alaska, through the North American West, and down to Central America. Artists probe the geography of vast frontiers, rich natural resources, diverse indigenous peoples, westward expansion, and the inevitable conflicts that arise when these factors coexist. Architect Hugh M. Kaptur is a visionary designer who practiced in Palm Springs and the surrounding Coachella Valley from the late 1950s through the early 2000s. With more than 200 built projects in the area — residential, commercial, and institutional — he played a significant role in the architectural development of the region. Many of his designs are considered among the most creative and innovative of the era, and this will be the first museum exhibition of his body of work. Through architectural drawings, models, period photographs, and ephemera, along with new photography of select projects, the exhibition will show the range and importance of his practice, placing him in the context of his Desert Modern peers. Live painting Feb. 10-15, additional activities Feb. 17-22, mural on view through 2020. The Palm Springs Public Arts Commission contracted local artist Ryan Campbell to design and create an 80-foot mural, to be executed Feb. 10-24. The public is invited to watch, meet the artist and his team, and browse nearby artworks including Czech artist David Cerný’s “Babies” and a full-scale replica of architect Paul Rudolph’s 1952 Walker Guest House. Ongoing. Open daily sunup to sundown. If High Desert assemblage artists had a patron saint, it would be Noah Purifoy. Born in Alabama in 1917, he lived and worked in Los Angeles and Joshua Tree, where he died in 2004. Perhaps best known for his piece, 66 Signs of Neon, constructed of charred debris from the 1965 Watts rebellion, Purifoy had a profound impact on the art world, elevating discarded materials — and the lives they represent — into forms that can be sweeping or sturdy, witty or threatening. The outdoor museum consists of 10 acres of art made from found objects, gracefully decaying in the wind and sun. Opening reception: March 3, 2-5 p.m. The artists in this inaugural exhibition form a loose network of friends and colleagues whose works elicit a careful reading of human bodily experience. In particular, they impart a delicate sense of how to care for and remain aware of our unique physicalities, even as we navigate the crush of daily life. Their practices vary widely in material exploration, yet follow common threads of self-inquiry into new definitions of health. In the face of growing social tensions, R.A.T. is a call-to-action-style engagement. Through artistic encounters, we hope to radicalize against growing isolationism and separation. Artists: Michelle Castillo, Minkyung Choi, Adriene Jenik, Matthew Savitsky, Rudy Shepherd, and Chantal Wnuk. Absolutely Abstract is a survey of differing modes and styles of abstract art. The exhibition touches on artists’ responses to contemporary life — to individual interpretations, new materials, new technology, and the endless pursuit of the “now.” Exuberant craftsmanship and playful use of color evoke natural and mental landscapes, demonstrating how abstraction can, at times, accommodate spiritual and emotional content. Artists: Blake Baxter, Luther Broome, Mads Christensen, John Eden, Christopher Georgesco, Jimi Gleason, Kat Green, Emily Elisa Halpern, Yann Houri, Terrell James, William Loveless, David Mackenzie, Michael McCall, Hiroko Momii, Andy Moses, James O’Keefe, Jon Peterson, W.C. Richardson, Robin Rose, Yong Sin, Delos Van Earl, and Robert Walker.